Did you hear that One World Trade Center is now complete? Okay, the one in downtown Manhattan is still under construction but Stan Munro's 1:164 scale version made out of thousands of toothpicks is already standing tall, and looks almost exactly like the real deal (you know, besides being made of toothpicks and all). We spotted the self-proclaimed "toothpicker" at Maker Faire this past weekend as he showed off his insanely intricate architectural replicas to the crowd. Click through our pics of Munro's amazing "Toothpick City" and see how many of these masterpieces you recognize. Oh, and read on for the best part of this whole story - why Munro signs every one of his buildings "I luv Suzi." Toothpick One World Trade Center stands just over 10-feet-8-inches tall. We congratulate Stan and Suzi for making it through some really rough times, and think they are a wonderful example of how something horrible and negative can be channeled into something wondrous and truly inspiring. The crowd at this weekend's Maker Faire went wild for Munro's intricate architectural replicas. You might be wondering how one might pick up toothpicking as a full-time job. While it began as a childhood hobby, toothpicking stayed with Stan ever since 5th grade, and became something more about 10 years ago when his wife Suzi was stricken with Polycystic Kidney-Liver Disease (PKLD). Stan had held many types of positions before, but he knew that he needed to be home for his wife, so he began working on and promoting his toothpick art. In 2006, he sold his very first Toothpick City to a Spanish museum and was able to support himself and his wife, who finally started getting better after receiving a double-transplant at the Mayo Clinic in Jacksonville, Florida in 2011. "He signs all his buildings:' I Luv Suzi'," explains Suzi, "and I think it's cute..."
An aerial shot of Toothpick City at this year's Maker Faire. An extremely detailed replica of St. Patrick's Cathedral. Toothpick City is not anywhere near complete. 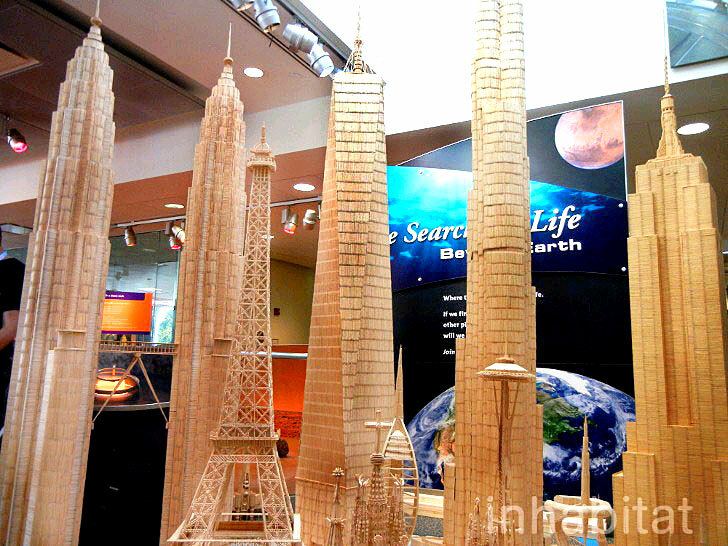 Munro says he will try to make every building in the world out of toothpicks. Curious makers surrounded Munro to ask him about his toothpick architecture. While Munro, who is from Syracuse, NY, makes architectural replicas of structures from around the world (do you recognize Toothpick Burj Khalifa and Toothpick Eiffel Tower? ), many of his works are based on famous Big Apple buildings. He recently finished a crazy replica of the new Yankee stadium and even filled it with tiny toothpick "fans." An aerial shot of toothpick Yankee Stadium.